Another sad piece in the series about games that could have been awesome if the publisher company - or individual corrupted devs wouldn't rig it for more money. Albion Online is still in beta when I'm writing this, so several of its problems can be addressed later. But the gold speculation issue would be so easy to fix and serve absolutely no in-game or even legitimate monetization goals that it cannot be overlooked. Its continued existence made me sure that some Albion devs are corrupt, are in league with goldsellers, therefore I strongly recommend you to avoid this game. Gold is the "premium currency" of the game, you can buy 1000 gold for about $5. You can use it for subscription of the game, 2500 per month. You can freely trade it for in-game currency (silver that you can farm), like WoW token. What's the problem? 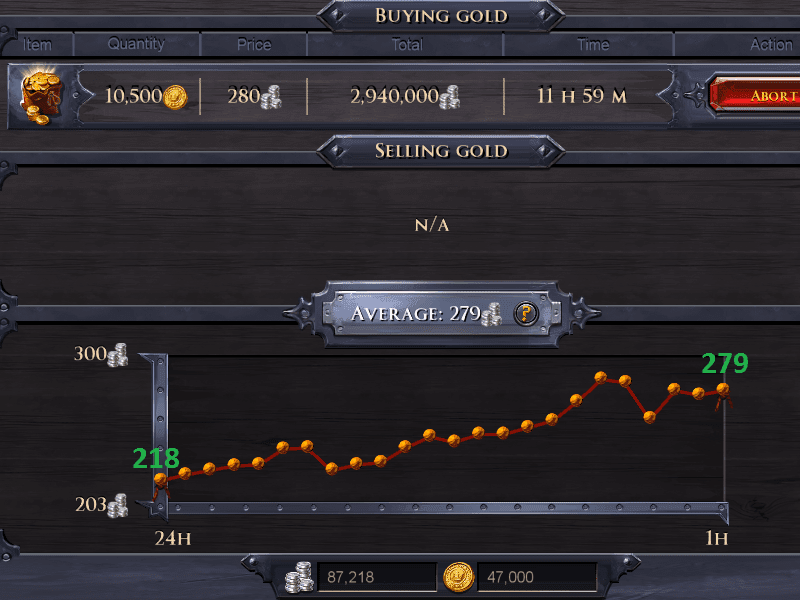 That's 25% increase of gold price in a single day, and not on day one of the MMO. Anyone seeing this coming could increase his in-game wealth by 25% without even logging in. No need to explain how big goldmine this is for goldsellers if they can guess how the prices will move - or get inside info from the developers who have all the marketing data about the gold buying (supply) and gold using (demand) behavior of the players. "But, but, but free market". I'm all for free market in-game. Gold is not an in-game item, you can't use it for anything else but buying subscription and cosmetic items. Gold is essentially coupon to buy real-world commodity: subscription to a video game. It has a clear, official $ value. No way to farm it: if a wannabe monopolist tries to corner the sword market, people can craft more swords, both for themselves and to break down the prices. No one can craft gold. Gold can only enter the economy by someone paying for it and just because prices spiked today, not many people will pour in thousands of dollars. So the speculation cannot be defeated supply side. There is no alternative: you can use your old sword. Or buy a lower tier sword. Or choose to level your bow skills you are planning anyway if the sword prices just spiked. This decreased demand makes any kind of sword speculation pointless. But the only alternative of not paying your subscription is being utterly non competitive in everything. The devs made it clear that while one can log in for free, he can't expect any kind of success, free is for looking around the game. So no matter how high the gold prices are, people will pay up. There is practically infinite market size: even if no sword crafter noticed your little monopoly and all the sword buyers are hell bent on buying swords, you are still limited by the sword market. Not many people buy a new sword a day. But there is a huge traffic for gold. For comparison: in EVE 1400 T ISK was spent on buying PLEX (premium currency) in a year. The value of all items produced in a year is 1100 T. So one controlling the PLEX market makes more money than the one who controls the price of every ship, module and structure. This is why people don't bother to trade items on the New Jita citadels, just PLEX and injectors. Taxing: every sales in the game have 1% listing fee and 2% tax. Except gold sales which are free of tax. This is the opposite of what should be done: punitive taxes to prevent resales. Maximum stockpile: the most expensive item in the shop is the 1-year subscription for 19000 gold. There is no reason for anyone to hold more gold than that, stockpiles can be maxed around this value to prevent people storing gold. This means that it's existence is the sign of ill will of some devs who are in league with the goldsellers, giving them insider tips (about marketing data or incoming developer intervention) how to speculate and then split the money made by selling gold. Such developers will surely rig other things, especially those that risk their illicit income. There is no point playing a game where the "gods" are simple thieves. PS: even if the devs are innocent and all the gold speculators are speculating for challenge and not for RMT, the game is still a one dimensional one where only your gold speculation skills matter and these skills are about predicting the real world payment schedules of of people. Why would anyone play this game?